Today is Book Lovers Day!!! The Martian Chronicles was my first indoctrination into Science Fiction for adults. What I discovered in that slight, battered paperback in my early teens awakened me into entire new realms of thought and understanding to the different ways a story could be told. 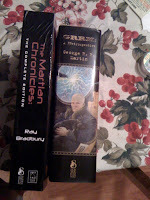 For that reason I was truly lucky to receive a galley of the joint PS Publishing and Subterranean Press's definitive edition of Ray Bradbury's The Martian Chronicles to remind me of why I love Science Fiction(see this article to see why I was wavering). With more than 50 stories, essays, introductions, and two full-length screenplays by Bradbury, The Martian Chronicles: The Complete Edition is a volume destined for the display shelf. It will proudly sit there shouting to all who enter my library area and shout that this is one of the best books of its kind, ever. As soon as I opened the package I was blown away but it sheer size, weight, and completeness. I immediately starting reading the introductions and found myself reading the majority of the original story and than thumbed through many of the unpublished short stories gems, which would be worth the price alone for the true Bradbury die-hards. However, this is no single sitting book, but one to be savoured and reread for years to come. This edition does adopt the renumbered years starting from 2030 used in the recent versions of The Martian Chronicles rather than 1999 as they were originally published. This is one point I think the publisher should have stayed to the original, but moving up the years does provide the reader easier context to think of the stories as placed in the not too distant future. We are treated with remembrances from John Scalzi, Richard Matheson, and Joe Hill about how the work has influenced them in addition to Bradbury's own recollections of its creation. Some of these pieces have been published before in earlier editions, but this is the only place to read them all together and the Scalzi Foreword and Hill Afterword are available only in this edition. I can only imagine the weight of the final hardcover, but to give you some perspective here it is next to my copy of G.R.R.M: A RRestrospective, which was later released as Dreamsongs in two volumes. A RRestrospective is one of the largest non-reference books in my collection and you can see how Chronicles more than stands up to to it in size. 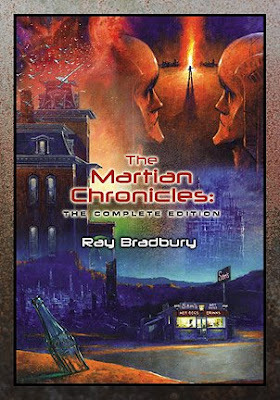 If you are a Bradbury fan or have a deep love and remembrance for The Martian Chronicles I highly recommend you get a copy from Sub/PS while they are still available. The publishers have truly done justice to Mr. Bradbury and the stories. Also, if you haven't ever read The Martian Chronicles or haven't in a long time go pick-up a copy. You won't be disappointed. Sounds like an incredible edition, but that price tag is huge. It is pricey. That cannot be denied, but sometimes you get what you pay for. I've never been disappointed by one of Sub Press's editions. This one is definitely for the serious collector. At least they added in a bunch of stories you can't get anywhere else. I think that is the big appeal outside of having an edition that will hold-up a lifetime.